The RIM-67 Standard ER missile can only be launched from rail-type launchers, so AEGIS ships with the MK 41 VLS (Vertical Launch System) could not deploy the Standard ER. Therefore, the Block IV variant of SM-2ER was developed to provide AEGIS/VLS ships with an extended range, improved cross-range and high-altitude air-defense capability. 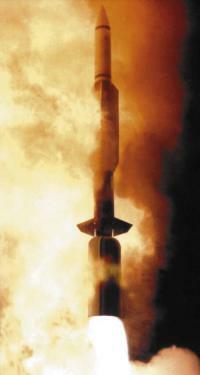 The U.S. Navy originally requested the designation RIM-68A for the Block IV missile, to follow on from RIM-66 and RIM-67. However, although the original AIM-68 designation for a 1960s USAF project had long been cancelled, the regulations do not allow the reuse of an old design number. Therefore the request was turned down, and the designation RIM-156A was allocated instead. Some sources seem to indicate that SM-2ER Block IV is designated RIM-67E, but this is not correct. At best, RIM-67E was a brief interim designation before allocation of the final RIM-156A nomenclature. The RIM-156A uses a completely new MK 72 booster, which is significantly shorter than the original SM-2ER booster, has no fins, and uses thrust-vectoring control. The missile itself is also improved, featuring guidance and control modifications, including an upgraded MK 45 MOD 10 TDD (Target Detection Device), for improved performance against high-performance, low-RCS threats in severe ECM environments. The Block IV is also a developmental step toward the Block IV A (see below), the forthcoming Navy Area Theater Ballistic Missile Defense (NATBMD) missile. Problems with the new booster significantly delayed the program, and the first launch did only occur in December 1992, about 18 months behind schedule. Because of the delays, the capabilities of the SM-2ER Block IV were at first not fully evaluated, and emphasis shifted toward the development of the Block IV A TBMD missile. Testing of the Block IV continued, however, and IOC (Initial Operational Capability) was finally declared in August 1999. The RIM-156B SM-2ER Block IV A was planned to become the missile component of the Navy Area Theater Ballistic Missile Defense (NATBMD) system (lower-tier ballistic missile defense), but did also retain all anti-air warfare capabilities of the Block IV. It featured a dual-mode RF/IIR (Radio Frequency, Imaging Infrared) seeker, had an upgraded MK 125 warhead package, and an enhanced autopilot for the anti-TBM mission. The RIM-156B was to be used with a modified AEGIS weapons system with added TBM tracking capability. 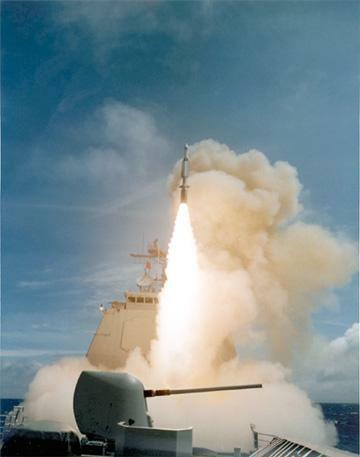 Flight tests started in 1994, and in January 1997, a ballistic missile (a MGM-52 Lance target) was shot down by a Block IV A missile for the first time. The EMD (Engineering and Manufacturing Development) phase of the RIM-156B lasted until December 2001, when the whole NATBMD program was cancelled. The original plans had called for an IOC (Initial Operational Capability) date of 2003. One derivative of the Block IV/IV A is the RIM-161 Standard SM-3 NTW (Navy Theater Wide) TBMD missile, which is an upper-tier ballistic missile defense weapon to complement SM-2ER Block IV A. Another one is the RIM-174 ERAM (SM-6) Extended Range Active Missile, which is in development until 2010.